Although Americans are eating more chicken, they still love their beef, and average more than 50 pounds of beef per person each year, according to NPR. It's OK to eat meat, but you're better off if you keep your choices lean, and that means having a 3-ounce serving that has less than 10 grams of total fat, 4.5 grams of saturated fat and 95 milligrams of cholesterol. If you like sirloin and filet mignon, you're in luck, because both are lean cuts. But nutritionally, the filet mignon might make a slightly healthier choice. When it comes to calories, both the sirloin and filet mignon are fairly equal. A 3-ounce portion of cooked sirloin contains 180 calories, while the same portion of cooked filet mignon contains 179 calories. If you eat 2,000-calories a day, one portion of either meat provides less than 10 percent of your daily calorie needs. While the sirloin and filet mignon are not the lowest calorie cuts of beef, they still make a fairly good choice for the calorie-conscious diner. As you might expect, both cuts of beef are very good sources of protein, but the filet is a slightly better source. A 3-ounce portion of the sirloin contains 25 grams of protein, while the same serving of filet mignon contains 26 grams. Women and men need 46 and 56 grams of protein a day, respectively. In general, most men and women do not have a difficult time meeting their daily protein needs, according to the Centers for Disease Control and Prevention. Three ounces of cooked sirloin contains 8 grams of total fat, 3 grams of saturated fat and 75 milligrams of cholesterol. The filet mignon has a little less total fat, but is slightly higher in cholesterol, with 7.5 grams of total fat, 3 grams of saturated fat and 79 milligrams of cholesterol. While it is important that you limit your intake of cholesterol from food, it's the saturated fat that causes the most problems. High intakes of saturated fat increases blood cholesterol levels and risk of heart disease. The 2010 dietary guidelines for Americans recommends that you limit your intake of saturated fat to less than 10 percent of calories and cholesterol to no more than 300 milligrams a day. 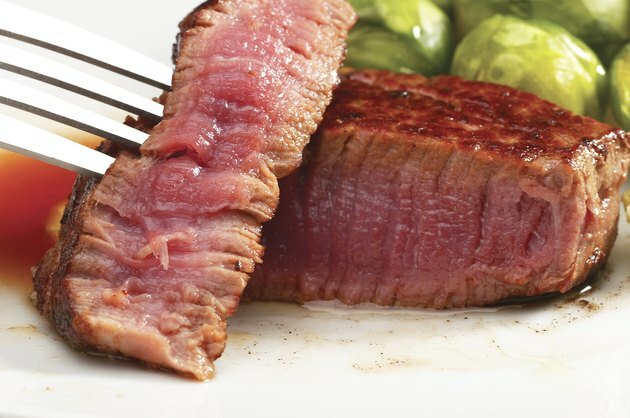 Protein foods, like sirloin and filet mignon, help you meet your daily needs for B vitamins, iron, zinc and magnesium. The filet mignon is a better source of iron, magnesium and vitamin B12, while the sirloin is a better source of zinc. Vitamin B12 is necessary for the production of DNA, and also keeps your blood cells healthy. Iron also keeps blood cells healthy by helping you make hemoglobin. Zinc supports immune health and helps heal cuts. Without magnesium, your muscles would not be able to contract and relax properly.